Who Should get Travel Insurance? We hear from Canadians all the time about their cousin, friend, or aunt so-and-so who went on a vacation without insurance and were just fine. We’re sure that’s true, but insurance isn’t there for the times the vacation goes fine and dandy. On the contrary, Health Risk is there for when the plan goes terribly, terribly wrong, and you need to know that everything’s going to be okay. The fact is plans can go wrong for anyone. Kids get sick, teens get hurt, parents get stressed, and seniors are prone to experience all three at once. At Health Risk, we cringe when we hear about a group of guys or a young couple in their twenties going for a week long vacation without insurance. While it’s true that young people are less likely to get sick, they’re more likely to push themselves physically and get injured. Regardless of how old you are or your personal medical history, if you’re travelling abroad, you and your companions should have travel insurance. A Whole Family Solution. At Health Risk we’re proud to offer Canadians what we like to think of as a whole family solution. Our coverage offers an affordable solution to Canadians that include an unlimited number of dependents. While the age of majority in most Canadian provinces is 18, Health Risk is happy to provide any dependents 21 and under with coverage through your family plan. If you have a full-time student in post-secondary, then we’ll extend that coverage to include that dependent until they’re 25 years old. Summer Break Adventures! One of the best things about our family travel insurance is the kids are covered even when they travel alone. This can greatly benefit high school or university students who want to go on a trip with their friends, and you’ll love knowing that, if anything happens, Health Risk has them covered. TRAVEL MEDICAL COVERAGE DESIGNED FOR SNOWBIRDS! Love heading south for the winter? Whether you do weeklong trips or stay all season, we can provide coverage for your time away from the snow. Our travel medical insurance has no age limit, the Medical Questionnaire is quick and easy to complete, and competitive pre-existing conditions. Guests to Canada. Part of being Canadian is embracing multiculturalism. Many of us are descended from ancestors who came across the ocean from Asia, Europe, or Africa. Other Canadians may have family member or friends living in Australia or south of the border. When your friends and family come to visit you from other provinces or abroad, they won’t be covered by their provincial health plan. You’re able to go to the hospital in your home province for free, but the same doesn’t apply to your visitors. Because of this, it’s important to encourage them to buy travel insurance. That way if they get ill or injured during their trip, they won’t be facing thousands of dollars in medical expenses. Planning a trip is a lot of fun, but there’s more to it then making sure you have enough underwear and sunscreen. 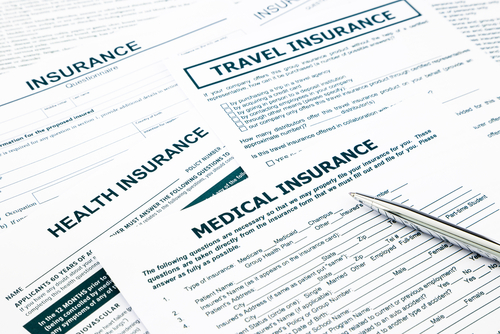 If you’re planning on travelling, be proactive: buy travel health insurance. Have questions about your health coverage when you’re travelling out of Canada? Health Risk can help! Contact us today at 1-877-236-9430.